This entry was posted in Book, Book with Chrissie, CRAFTed, Felt, workshops and tagged Dawn Edwards, Fantastic Felt Hats, felt book, felting workshop, nuno felt book by Nicola. Bookmark the permalink. Well, off to prepare to head to the airport shortly. A nudist? Is that why she only packed hats? Seriously, these hats are very impressive! I hope the workshops are wildly successful. Have so much fun together!!!!!!!!!!!!!!!!! How exciting g for Dawn to be making her first trip to Ireland and even more so doing something she loves to do, with a good friend. We are alll anxious to see the photos of her workshops. What fun you will both have. Mummm – love those hats. 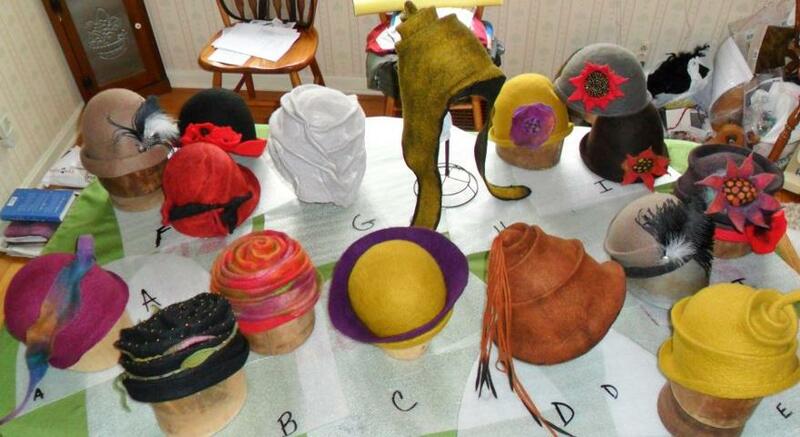 Those hats are beautiful..I especially LOVE the green one with the earflaps!